Tiji Festival is the popular festival in Nepal, Upper Mustang, which is considered as the adorable festival by most of the outsiders. This is a famous Tibetan Buddhist festival that is celebrated in the fabled walled city of Lo- Manthang. Every year, with the myriad participation of outsiders and their great enthusiasm, Tiji festival is celebrated interestingly. As Nepal consists numbers of ethnic groups holding their own rites, rituals, dialect, culture, tradition and festival. The country steeped in the land of the Himalayas is also the nation holding with the rich cultural aspects. In a year, the visitors from different land enter in Nepal to observe its culture, tradition and festivals. Among the various main festivals, Tiji festival, also known as Tenji festival, holds the major role to make one’s trip interesting and memorable. Tiji festival, or Tenji festival, has been celebrated continuously for 3 days (May 30, May 31 and June 01, 2019). The rites and rituals followed on this festival is interesting to observe. As the festival takes place for three days, at the very first day of the festival, monks perform the mask dance which is called “TSA CHHAM”, in the second day “NGA CHHAM” and the third day the huge celebration of the Tiji festival known as “RHA CHHAM” where the monk in the role of Dorje Sonam throws effigy and Tsampa which represents Ma Tam Ruta. Such interesting cultural performances of monks and huge participation of people make the festival as an important festival of Nepal. 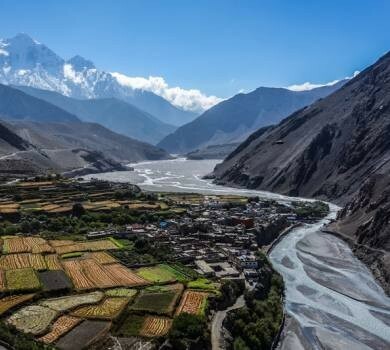 The trekking route followed up with the unique landscape of Mustang region, charming villages and the mesmerizing mountains makes the trek more astounding. Trekking to the place gifted by the god naturally and culturally is far beyond one’s expectation. The region renown for the surprising natural features is always ready to bestow such incredible images in front of travel seekers. Tiji Festival Trek brings up both cultural and natural features within a package. Trekking within Mustang Region is the marvelous adventurous activities that provides with the incredible view of opulent nature along with the popular festival of Nepal that is all the box up a package of 18 days and as per ones interest and time frame the trek can be customized. The date of the Tiji festival for 2019 has been published and Massif Holidays is accepting the booking for Tiji Festival Trekking 2019. This trek is fully supported guest house trek where the team of Massif Holidays is always available to make the trip wonderful. Get involved in this popular cultural trek, interesting and tranquil trekking route in Nepal, the team of Massif Holidays will provide with the detail information and help you to explore Upper Mustang and observe Tiji Festival with the best outcomes. 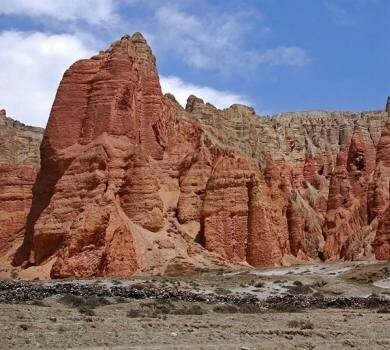 Please feel free to contact the local team of Massif Holidays for expert’s advice to visit Upper Mustang for Tiji festival 2019. UNESCO World Heritage Site tour in Kathmandu - Swyambhunath, Boudhanath, Pashupatinath and Kathmandu Durbar Square. Experiencing the lifestyle of different ethnic groups. Trek to the Annapurna and Mustang Himalayas. Fully supported guest house trekking. Warm up cultural tour of Kathmandu valley. Observation of the Tiji Festival and Buddhist culture in Tibetan community. Exploration of Kingdom within Kingdom- Mustang. Visit of popular Buddhist and Hindu Pilgrimage site- Muktinath. 17 Breakfast, 14 Lunch & 15 Dinner. Day 04: Fly to Jomsom (2720 Meters) and trek to Kagbeni (2810 Meters). About 3 hours. Overnight stay at Guest House. Day 05: Trek to Tsele (3050 Meters). About 6 hours. Overnight stay at Guest House. Day 06: Trek to Shyangbochen (3820 Meters). About 7 hours. Overnight stay at Guest House. Day 07: Trek to Tsarang (3540 Meters). About 6 hours. Overnight stay at Guest House. Day 08: Trek to Lo-Manthang (3710 Meters). About 6 hours. Overnight stay at Guest House. Day 09: First day of Tiji Festival observation at Lo-Manthang. Overnight stay at Guest House. Day 10: Second day of Tiji Festival observation at Lo-Manthang. Overnight stay at Guest House. Day 11: Final day of Tiji Festival observation at Lo-Manthang. Overnight stay at Guest House. Day 12: Trek back to Dhakmar (3820 Meters) via Ghar Gompa (Loghekar Monastery) (3800 Meters). About 8 hours. Overnight stay at Guest House. Day 13: Trek back to Samar (3550 Meters). About 7 hours. Overnight stay at Guest House. Day 14: Trek back to Kagbeni (2810 Meters). About 7 hours. Overnight stay at Guest House. Day 15: Trek back to Jomsom (2720meters). About 3 hours. Overnight stay at Guest House. Day 16: Early morning flight to Pokhara. Overnight stay at Hotel. Day 18: Transfer to the international airport for your onward destination. Airport/ Hotel pick up & drop by private tourist vehicle. Basic guesthouse and tea house accommodation during Tiji Festival Trek. Professional license holder English speaking Trekking Guide (if required with other nation’s dialect for Tiji Festival Trek). All meals including breakfast, lunch, and dinner during the trek. Annapurna Conservation Area permits and Special permit for Upper Mustang trekking. Airfare from Pokhara – Jomsom - Pokhara including fare of private transport (in Kathmandu). Drive from Kathmandu-Pokhara-Kathmandu by tourist coach. Including all government taxes, vat & service charges. Lunch and dinner in Kathmandu valley. Any kinds of beverages & bar bills (coffee, beer, soft drinks, etc.) and along with dry foods. Entrance fee at all monuments during the tours. Nepal entry visa fee, which can be issued on your arrival at Tribhuwan International Airport and also in the case for extending visa during the stay in Nepal. Scenic Flight ( From -KTM-Pokhara-KTM,& Pokhara-Jomsom-Pokhara). Extra additional Breakfast, Lunch, and Dinner throughout the travel package.